Coming off a career season, Aldridge has found the other end of the spectrum. I was not a fan of the LaMarcus Aldridge signing the summer it happened. I understood that Tim Duncan could not play forever, and the need for a big was apparent, but I thought Aldridge’s style of play was too far removed from a Spurs system that had morphed itself into a deadly, selfless, and most importantly, successful, motion offense. Back when Aldridge was the number one option in Portland, the Blazers struggled to make the playoffs. It took drafting Damian Lillard before they were able to win a playoff round under Aldridge’s tenure. Once Lillard became more of a focal point on offense, Aldridge’s efficiency plummeted. His final two years as a Blazer were the least efficient seasons of his career. To make matters worse, rumors circulated that Aldridge was unhappy playing in Lillard’s shadow, and Aldridge ultimately chose to leave Portland for the Alamo City. The Spurs have had their share of success since Aldridge joined the team, but Kawhi Leonard’s emergence as a top three player in the NBA cannot be ignored. With Leonard as the first option on offense, Aldridge underwhelmed in his first two seasons in silver and black. Aldridge even asked for a trade in the summer of 2017, unhappy with how he was being utilized in the Spurs system. Then last season happened. 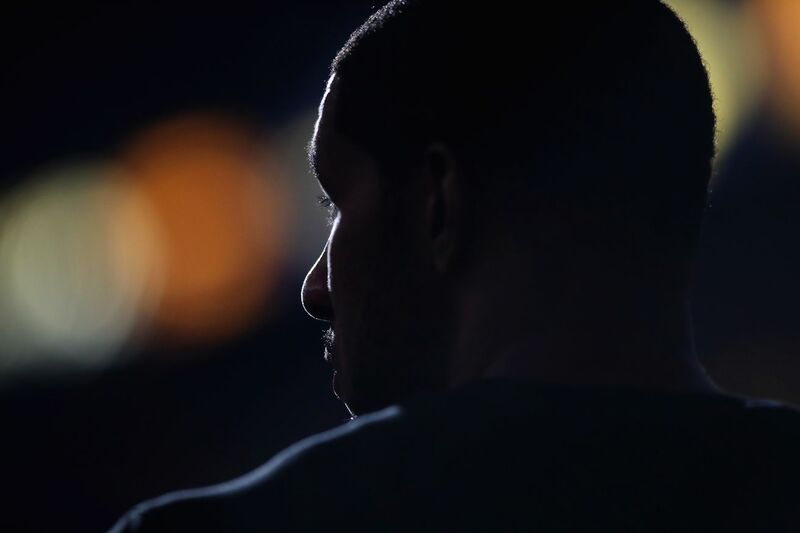 Whether by design or circumstance, Aldridge put together a career year while Leonard was in New York reviving the Broadway show “Betrayal.” Aldridge became the hero that Spurs fans weren’t sure they wanted. It’s only fair to give credit where credit’s due, and I did, but even a top notch Aldridge as a first option resulted in a first round playoff exit. This season DeMar DeRozan has taken over as the Spurs first option on offense and Aldridge is working towards the least efficient season of his career. Through the first sixteen games of the season, Aldridge is shooting 41.5% from the field. He has a career FG% of just under 49%, and last season he shot 51% from the field. And thus, the conundrum: Can a team be great when Aldridge is the focal point of the offense? Can Aldridge be great when he’s not? It would appear that the answer to both questions is ‘no,’ but the numbers suggest that a regression to the mean is likely. When researching Aldridge’s 2017-18 resurgence, I found that Aldridge was not settling for turnaround jump shots or long two point attempts. Instead, Aldridge was backing down opponents at will. By taking shots closer to the rim, Aldridge’s efficiency skyrocketed. Naturally, I assumed Aldridge had reverted back to taking inefficient shots this season, but that turned out to be an incorrect assumption. Last season Aldridge’s shots came from an average of 7.95 feet from the basket, down from his career average of 9.27 feet. This season it’s at a pretty remarkable 7.48, the lowest mark of his career. Aldridge is taking over 40% of his shots from inside five feet of the rim. This is 4% higher than last season and significantly higher than his career mark. 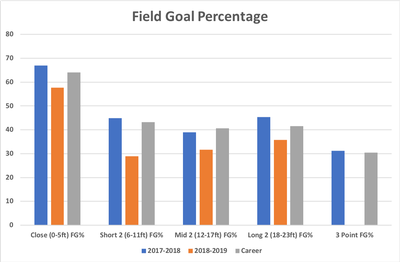 He is taking less three pointers this season, which has resulted in more long two point attempts, but that is not a major concern since he’s never been a high-volume shooter from distance. This shot distribution suggests Aldridge should be having another stellar season on offense, but it has yet to translate on the court. The numbers above are staggering. Aldridge is shooting at or close to career worsts from every level of the court. Some might attribute Aldridge’s struggles to a lack of playmakers, but DeMar DeRozan is as good of a playmaker as the Spurs have had in the starting unit since Aldridge came on board. Last season 50% of Aldridge’s points came off an assist, and that number is up to 65% this season. Last season 37% of Aldridge’s shots were considered open or wide open, and he hit those shots at 47% clip. This season the frequency of open shots has increased to 40%, but he’s only making these shots at around 38%. This is all just a long-winded way of saying Aldridge is getting open looks, his teammates are finding him in similar positions to last season, but the ball is just not going in the hoop. I think there’s something to be said about the Spurs not running their offense through Aldridge the way they did last season. Going to Aldridge in the post seems to be more of a second option, sometimes resulting in Aldridge getting the ball later in the shot clock than before. It’s possible this is preventing him from finding a rhythm on offense. I’m not sure it’s that complicated though. I think it’s more mental than anything at this point – think Bryn Forbes at the free throw line last season. Aldridge is having the best rebounding season of his career, including a robust four offensive rebounds per game. Unfortunately, he’s not turning those rebounds into easy points. In 38 put-backs this season, Aldridge has only 39 points – in other words, he’s only making half of his put-back attempts. The 1.026 Points Per Possession (PPP) in such attempts is far below last year’s PPP of 1.377. I always felt Aldridge could benefit from a pre-game layup line, but this season has been especially poor in this regard. I am guilty of yelling at the T.V. when Aldridge misses an easy one, but unlike seasons prior, his effort is too obvious to question. He’s giving it all he has, and in fact, might be trying too hard at times. Another factor in Aldridge’s inefficiency has to do with how he is coming out of the pick-and-roll. This season Aldridge is popping to an open spot 80% of the time, and those possessions are ending with a PPP of 0.6 – one of the worst marks in the NBA. With a PPP of 1.4, Aldridge has been very efficient when rolling to the basket, but he’s not doing this enough for it to have an impact on how opponents defend the pick-and-roll. By comparison, last season Aldridge popped to an open spot only 67% of the time and had a PPP of .888 – not great, but respectable. When rolling, he had an incredible PPP of 1.537. Aldridge has always been excellent at avoiding turnovers, especially when considering his high usage rate and the amount of times he gets double-teamed or trapped. This season he is averaging two turnovers a game, which would be the highest mark of his career. Even so, Aldridge has been excellent this season at finding teammates when being double-teamed or trapped during post-up possessions. In 77 of such possessions, Aldridge has only turned the ball over four times. When passing out of the trap, teammates have an above-average PPP of 1.2. These numbers are in line with last season. The issue has been in the pick-and-roll, where he’s turning the ball over four times as often as he did last season. The strange part about this is that he’s turning the ball over when popping to an open spot as opposed to in traffic while rolling to the rim. This is another strange outlier in a season of outliers that I expect to regress back to the mean as the season progresses. For the third straight season in a Spurs uniform, Aldridge has done an excellent job at preventing opponents from scoring close to the rim. Despite a porous defense as a whole, Aldridge is still doing his part. His numbers have been even stronger the past seven games, where opponents he is guarding are shooting on 43% from inside ten feet and 33% from inside six feet. Though a strong inside presence has not translated into wins — the offense has sputtered as the defense has improved — it shows that Aldridge is determined to have a positive impact on the court even if he continues to brick shots on the offensive end. 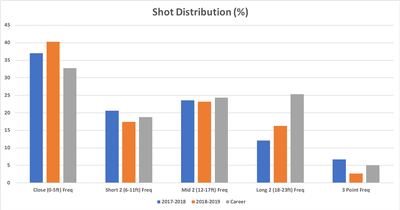 A sample size of a decade suggests that Aldridge is going to fix whatever is ailing his shot, but even he admitted after the Clippers game that he’s never struggled like this before. Aldridge is putting himself in the right position to be successful, so he — and us fans — need to stay patient. Once some of these shots start to fall, the Spurs offense is going to hit heights we’ve only seen in short glimpses so far this season.